You might be an entrepreneur with a massive social media following, or an office worker without a Facebook account – but we all have a personal brand. And it starts with what people might say about you when you walk out of the room. 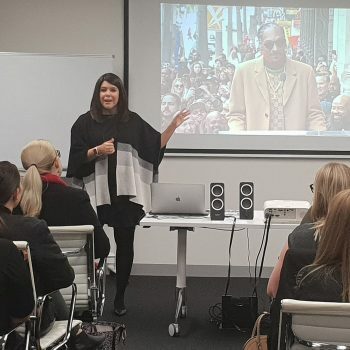 Attendees at Spence Club’s 2018 Annual General Meeting took advantage of a free workshop with Dena Vassallo, the Adelaide-based founder of Society Marketing and Communications. Dena took about 40 of our members through her top tips for developing, and maintaining, your personal brand. Your personal brand is all about the experience you give people. Try asking three people you know what it is that they like about you. If similar things emerge, that’s a start for your personal brand. Next, write down a few words about why you think you do what you do, and what you’re all about. Dena shared her list for developing Society with us, which included phrases such as Enthusiastic, Honest, People First, More Focus, Passion and Influence. When it comes to your brand name, choose something that will evolve with you, so you don’t have to rebrand. A solid option is to go with your name. Once your brand is up and running you have to “do the work”. Be consistent – and a bit personal if you’re comfortable. Social media platforms like Instagram and LinkedIn are a great place to start. Only bother with a personal website if it’s already full of good content when you go live and you’re going to post regularly. Alongside Dena’s insights, our AGM offered attendees access to a professional photographer taking sharp new headshots – and the nibbles, drinks and networking time that Spence Ladies have come to expect! Special thanks to Intersect for allowing us to use their co-working space and Grays PR for wine sponsorship. Keep an eye on our website and social media (Facebook, Twitter, LinkedIn and Instagram) for updates on upcoming events. If you’re not already in the Club, join us now to receive discounted tickets to upcoming events.